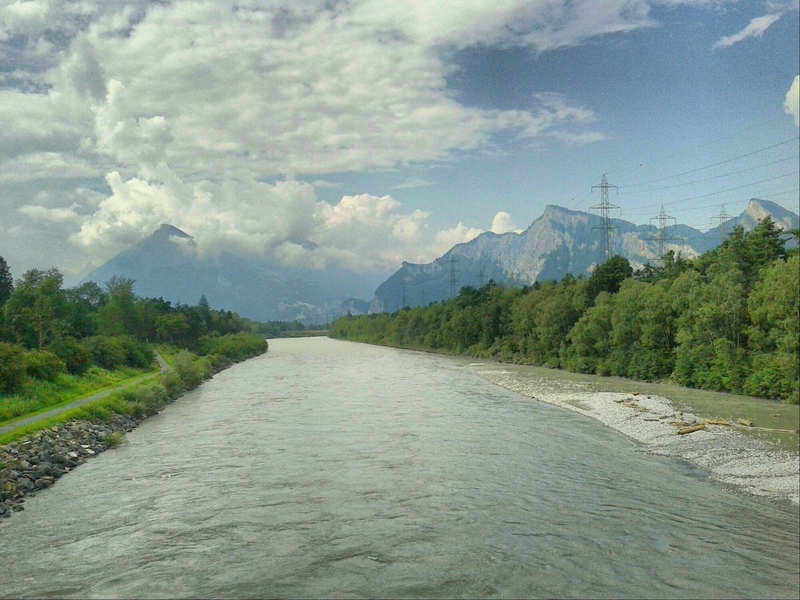 Austria-Switzerland-Liechtenstein: two three-country days. On Wednesday, leaving from Austria, I reached countries #5 and #6 of this trek. And today, Thursday, I touched all three countries again. The Totalp (“dead pasture”), on which the Totalphütte sits, has an interesting legend (which is told similarly in other parts of the Alps where there are barren high plateaus). This rocky, snowy plateau, it is said, used to be a lush, grassy pasture where wealthy farmers would take their cows in the summer. One day, god dressed up as a beggar and went wandering around the huts here begging for some food. The selfish farmers, however, refused to help the beggar, and even taunted him and played jokes. To punish them, he turned their most beautiful high pasture into a barren land of snow and rock, and the farmers themselves became poor. 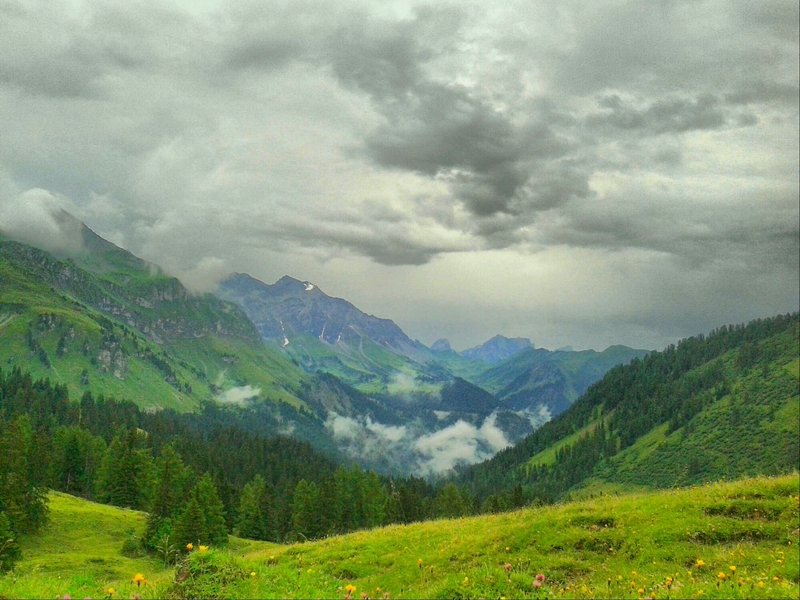 The people of the Alps thus have their own tales about justice and injustice and the importance helping strangers. Finally, the incessant rain which had been going for two days since Monday morning stopped on Tuesday night. 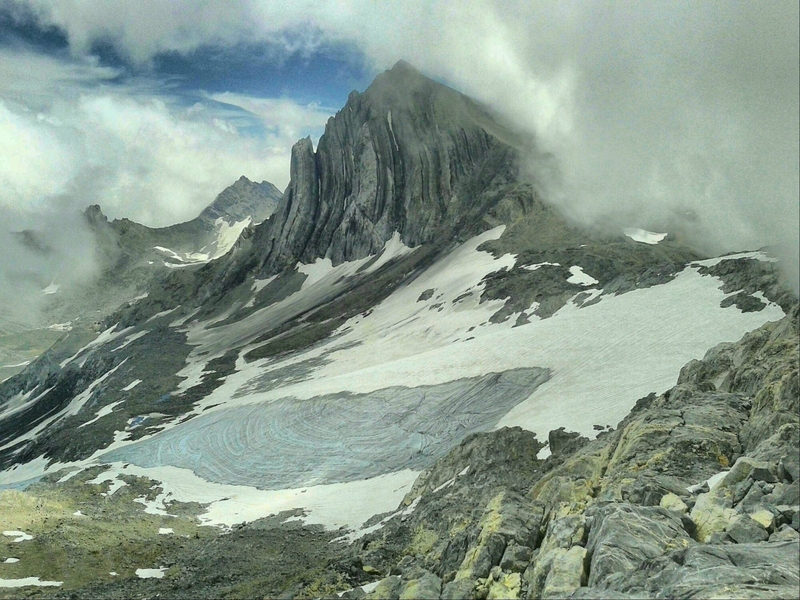 With the skies clearing up, it was possible on Wednesday to climb a high peak, Schesaplana, at 2965m. 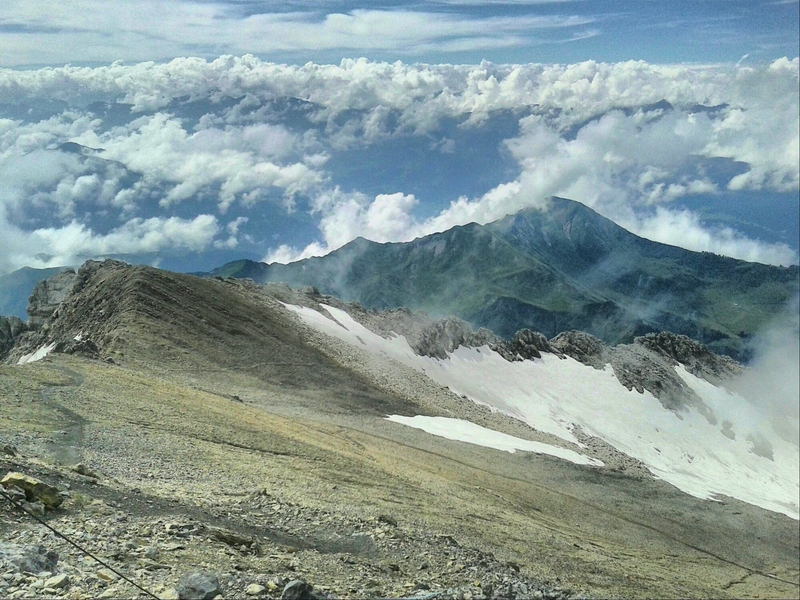 Schesaplana is the highest peak of the Rätikon range, located on the border of Austria and Switzerland. Regrettably, even though I waited around at the top for a while, the clouds never completely lifted, so the view to faraway mountains like Bernina remained blocked. Nonetheless it was an interesting day’s hike, ascending over the Totalp to the Schesaplana, and then following the ridge westward. The route included crossing part of what is left of the Brandner Gletscher (no crevasses), which must just a few decades ago have been a much larger icefield. 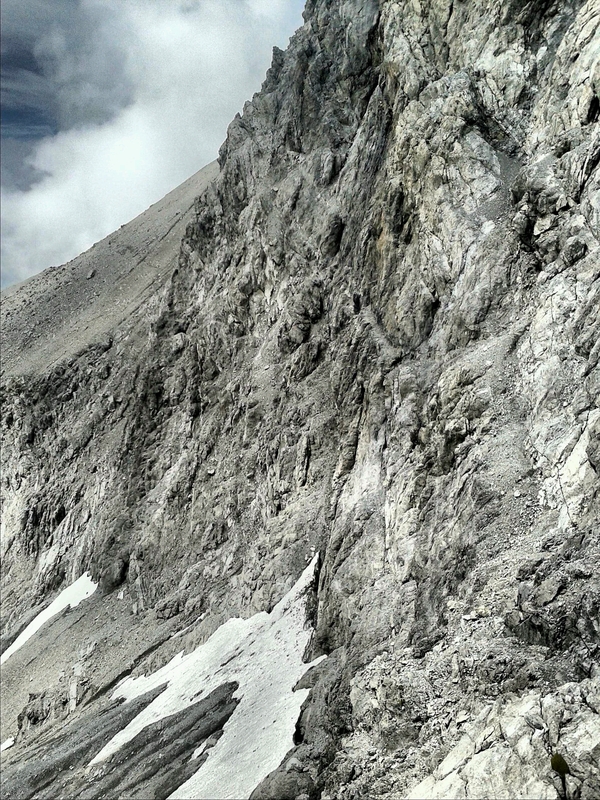 Then the trail crossed over into the southern cliff face of the mountain range, following a very narrow band of rock. 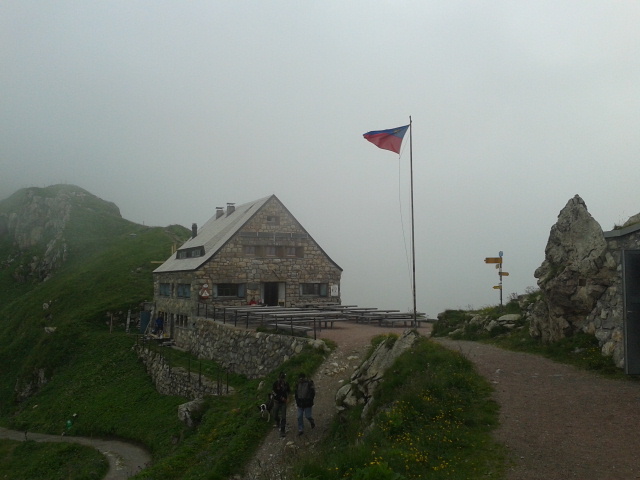 In the afternoon, walking across high pastures, I crossed over from Switzerland into Liechtenstein and, given the thickening clouds, decided to spend the night in one of the two alpine refuge huts in the country, Pfälzer Hütte. 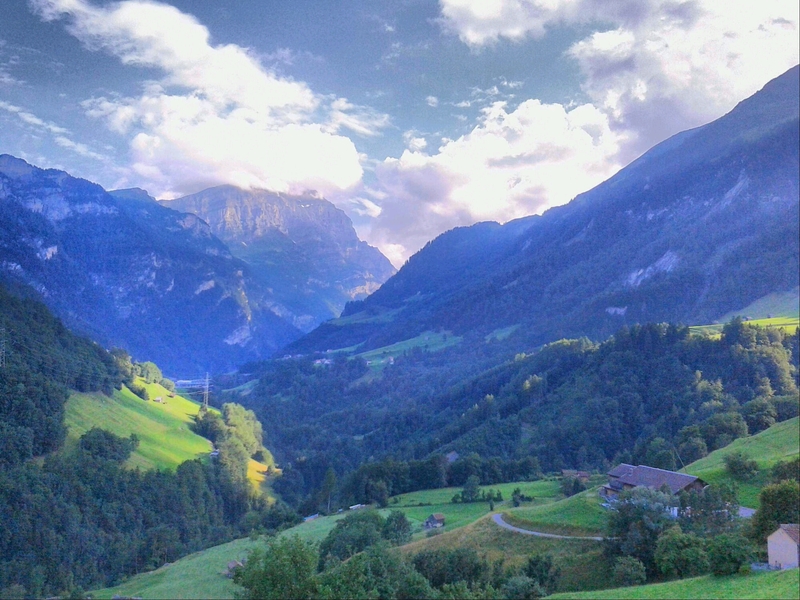 Ah, Liechtenstein. Yes, it’s my sixth country on this trip. But I think it’s fair to say that the country is little more than a relic whose only modern purposes are to lend prestige to some anachronistic rural royal family, and to act as a tax haven for ultra-rich Europeans. 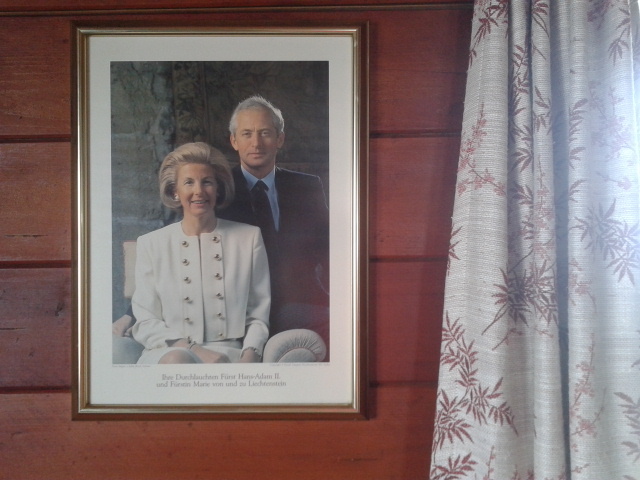 For what it’s worth, apart from the portrait of the duke and duchess on the wall, and the slightly higher prices, Pfälzer Hütte did not feel much different from the other refuges I’ve visited so far. Today, Thursday, began with a bang. 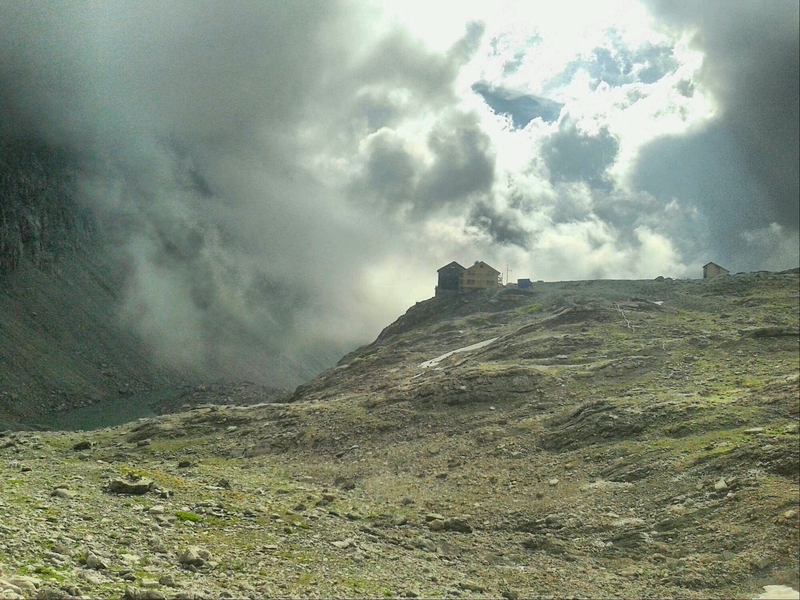 Soon after leaving the Hütte, heading back into Austria on the way to Switzerland, I got caught in a surprise morning thunderstorm, complete with hailstones and all. Not a nice start to the day. Then for the 1600m descent into the deep Rhine valley it seems I followed poor advice; the way I went down was an endlessly winding, curvy cart track. I was just plainly bored and tired by the time I reached the village of Jenins. From there, I crossed the valley to the posh spa town of Bad Ragaz, but not to stay there, just to buy some food and a new map.